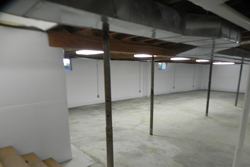 If you're experiencing a musty, damp, or leaky basement, you may need waterproofing contractors to fix the problem. Our waterproofing contractors have experience locating the cause of the leaks in your basement and getting them fixed right. While your home was built to withstand exposure to moisture and dampness beneath the soil, sometimes, after years of exposure, its basement sealant breaks down and becomes less effective. When this happens you may begin to notice a musty smell, damp walls or floors, or trickles, leaks or water pooling in your basement. The effects of water damage are extensive, and steps should be taken to prevent them right away. Speak with a waterproofing contractor now. Not only does standing water and moisture have ill effects on air quality, it can also cause the pipes in your walls to rust, your drywall or ceiling tiles to crumble, and your joists and other wooden structural components to dampen and begin to rot. Water damage is cumulative, too, in that the longer it goes without being fixed the more damage it's able to do - and the more expensive it becomes. 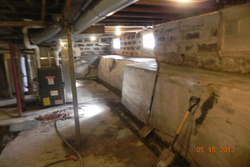 If you're experiencing a musty, damp or wet basement, don't hesitate - give our waterproofing contractors a call today! How did water get into my basement? There's plenty of reasons that water could be in your basement, and our waterproofing contractors will get to the bottom of it. When your home was built, the foundation was laid and the basement built up inside a big hole that was dug in the ground. When the basement was complete and tar or other sealant applied to it, the soil was filled back in between the hole and the wall. This soil is far looser than the soil around it, on account of being dug up and replaced, and because of that it more readily absorbs moisture. This excess moisture puts plenty of pressure on your basement's sealant, and if there are any flaws in its application it may break down and fail over time. Flaws in construction aren't the only possibilities, though. Basement sealants are only meant to stand so much pressure, so if your home has experienced far more precipitation than was expected in your area over the years, the sealant may be simply unable to withstand the elements. No matter what the reason is for your leaky basement, our waterproofing contractors will find it and get to the bottom of the problem. Give us a call today! What gets damaged by water? The short answer is that water damages everything. Our waterproofing contractors will find all of the damage and advise you on how to proceed from there. When water seeps into your basement, it does a lot more than just getting your things wet and making your storage space unusable. Standing water or even dampness and moisture in your basement evaporate into the air and raise the humidity level. This increased humidity can be absorbed by other parts of your home like drywall, ceiling tiles, wooden furniture or fixtures, and even structural components like joists. This can cause all sorts of buckling, bubbling, peeling cracking, crumbling, swelling and warping, and in severe cases can even cause rotting and structural failure. We have waterproofing contractors standing by. In addition to the water's effects on your home, it also threatens the health of you and your family. High humidity and wet walls, wood and furniture can encourage the growth of all kinds of mildew, mold and fungus spores. Mildew, mold and fungus are terrible for people with existing respiratory complications like allergies or asthma, and can even cause upper respiratory tract infections in healthy people. Our waterproofing contractors are dedicated to finding the source of your leaky basement, and putting and end to it for good!